Bad-breath bacteria is hiding in the nooks and crannies at the back of your tongue. One quick spritz of the BreathRx Anti-Bacterial Tongue Spray immediately starts killing these nasty bacteria. 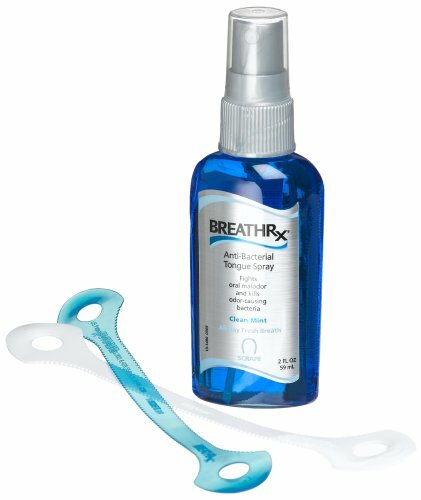 With more active ingredient than BreathRx mouth rinse, BreathRx Anti-Bacterial Tongue Spray offers added strength where you need it most- your tongue. Use BreathRx Anti-Bacterial Tongue Spray and the BreathRx Gentle Tongue Scraper for a clean sweep. Contains (1) Anti-Bacterial Tongue Spray- 2oz bottle, (2) Gentle Tongue Scrapers. If you have any questions about this product by BreathRx, contact us by completing and submitting the form below. If you are looking for a specif part number, please include it with your message.